The Indestructibles is now online! The Indestructibles is a low-budget, underground SF film. Some of you have followed the progress of making it through my film journal. As promised from the very beginning: the film is now online for free, split into seven parts for easy watching. Here’s a short synopsis: For over 200 years, superhero battles ravaged the earth. Once they were defeated, hundreds of thousands superhero bodies littered the streets. They are living, breathing vegetables that cannot die and do not grow old. One day, the superheroes come back. Only Rachel Gardner, a high school teacher, can stop them. If you enjoy it, help spread the word to people you think will like it. The Indestructibles Film Journal #10: The Film Is Alive with the Sound of Music! Let’s start at the end: The film is scored. And it sounds amazing. It took a long while to get it done, but that’s how things work when you do a no-budget film. A small reminder: I took a $200 million idea for an SF film and rewrote it in a way that would cost only $250 (no thousands, no millions). Check out the earlier film journals to see how it was done. This meant everybody worked for free, including my music guy, the super-busy and talented Boaz Cohen about which you will no doubt hear in the future. I had to wait 3 months after editing for him to just have time to look at the project. Then, between his work and other projects he was handling, he gave his sparse spare time to score The Indestructibles. So it took time. But it’s real. And it’s spectacular. Now that we got that out of the way, let’s talk about why scoring The Indestructibles was an impossible task. How do you solve a problem like no budget? A small reminder: The Indestructibles was originally to be an epic superhero film, with hundreds of thousands of superheroes, and a story spanning more than 300 years. There were good guys, a major bad guy, special effects, a background you’ve never seen before in comics or in film, and a twist on the superhero concept that’s entirely new. And… it cost too much. This digital age being what it is, I found a way to rework everything: There would be no special effects and no CG. But the experience should lose nothing: The film is still an epic tale with hundreds of thousands of superheroes and a story spanning more than 300 years. There are still good guys, a major bad guy, a background you’ve never seen before in comics or in film, and a twist on the superhero concept that’s entirely new. Like all good superhero films, there’s a great showdown at the climax. Yes, a powerful and emotionally-rewarding superhero showdown with no CG. And then there’s a twist in the end that, no matter how savvy you are, you’ll never see coming. All this without showing one costume, one power, or one fake special effect that would look ridiculous in a film with my budget. There are just two actresses and one location for 95% of the film. So now we can finally get to the point of why scoring The Indestructibles was an impossible task. So. Two characters in one place go through a special kind of drama that mirrors the great epic superhero drama the film’s about. How would you go about scoring that? Boaz asked me this question, and I had to think about it for a couple of days before I had an answer I was sure of: We should score the movie we don’t see rather than the movie we do see. What’s the movie we do see? We see two characters in an underground garage going through their own personal and quite intense drama, building towards the showdown with the bad guy. What’s the movie we don’t see? More than a hundred thousand superheroes are reflected through the eyes and words of the characters. We experience superheroic adventure, sacrifice, tragedy, backgrounds, and battles – but we don’t see any of it. My decision was to score the second movie, the CGI-ed film, the one we hear about. 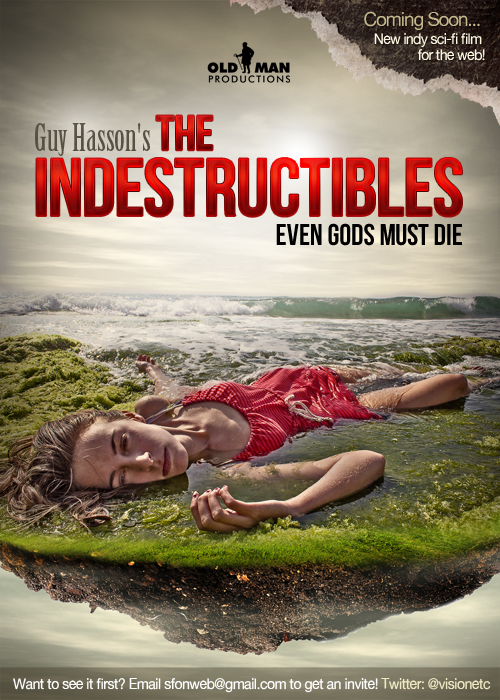 The movie you would have seen, if I had $200 million, is playing in the background of The Indestructibles, and now it’s fully scored. As an audience, you’re already emotionally experiencing the epic film. Now that the film is scored, that emotional experience is heightened with music that fits the film that’s playing on the screen in the back of your mind. Which means that your entire film experience is heightened. So, yeah, Boaz Cohen scored a film by scoring a film the audience doesn’t see. I said ‘impossible’, right? Want to See It for Yourselves? The film is almost finished – a couple more short stops and we’re done. Stick around. Stay updated. The superheroes are coming and the gods have to die. The weekend in which we were to shoot seven of the film’s eight scenes was upon us. And then Murphy’s Law struck once, twice, three times, and kept on bombarding us. And the great battle of The Indestructibles crew versus Murphy’s Law began. I’m not going to talk about the things that went through my mind. I’m not going to mention the image I had of her husband, standing in a King Kong pose atop the Empire State, holding the shirt in his two hands, then tearing it in two, screaming, “You’re not going to participate in this stupid film! Ooga ooga!” Sure, it went through my mind. But I know him, and I know that didn’t happen. We’re not going to talk about any of the scenarios that went through my mind, imagining how a shirt could be torn in two in the morning before a shoot. And we’ll get to what really happened. But in the meantime, what you need to know is that in my few years in film and my twenty years in theater, I’ve learned that Murphy’s Law strikes, and strikes hard. I came prepared. Before we proceed to see the vile and violent attacks by Murphy’s Law, let’s recap: The Indestructibles is an attempt to create a massive, epic science fiction story that would ordinarily cost hundreds of millions of dollars, with absolutely no budget. With today’s technology, it’s much easier to shoot film. And the need for CGI goes out the window if you tell your story well. If you tell the story right, if you direct it right, and if you use good actors, I’ll be able to give the viewers almost the same experience. That’s the goal. To read more about how I think it can be done see the first Indestructibles blog entry. A few days before the production, I discovered the soundman I wanted had decided to go to Paris. Solution: I did the sound as well as shot the film. It was a gamble, and anyone who comes from film would tell you you should never do the sound yourself. But now that it’s over, I can say that it worked. Problem solved! When I came to collect the equipment I had ordered for the shoot (lighting equipment), they couldn’t find the order. We quickly found it under another name, but during that time I was completely prepared, since the location is an abandoned parking lot, to shoot the film with my car’s headlights. I had actually planned for that eventuality the night before. The equipment was found. Problem solved! I had ordered two different lights, and before I put the equipment in the car, I checked that they worked. But when I got to the location, one of the lights no longer worked. The solution: The shoot only requires one strong light. I had ordered two just in case. Problem solved! Natalie Klein Selle, the other lead actress, has quite a long part in which she lies down as a vegetable and needs to breathe through her nose quietly. This breathing through your nose part of her job sounds trivial, but it became unbelievably important when she showed up with a cold and a stuffed nose. Fortunately, knowing Murphy’s Law was lurking, I had taken that eventuality into account and had bought nose spray the day before. She took it, her nose cleared, and we could shoot the film Problem solved! Finally, Tamara Pearlman’s husband tore her shirt in two. It was done innocently enough. There were knocks at the door while they were sleeping, and the husband jumped out of bed, not noticing that he moved the chair the shirt was on, dropping it to the floor next to the door. Then, still dazed, he tried to open the bedroom door. It resisted (because of the shirt on the floor). So he pushed. Hard. The door opened and the shirt became two smaller shirts. Solution: On her way to the shoot, Tamara went to the store in which she had originally bought the shirt and bought another one. Theoretically, we had another solution, because we had prepared two alternatives for her to wear. So, either way, problem solved! And now we’ve shot most of the film, and the dailies look so much better than I had imagined they could look. Murphy’s Law lost this time, though it will no doubt return again, having learned the lessons of this battle, and ready to try again. My guess is I’ll need the actors to wear body armor next time. Just to make sure they don’t break anything on the way to the shoot. Are you listening, Murphy’s Law? We’re ready for you! Do your worst! Come on! Let’s see you try! Every so often, I am starkly reminded that I live in two different worlds. One is the ‘real’ world, the regular world, the one where most of you, the readers of this blog, probably live. Everybody lives in the real world. Everybody except crazy people and… There used to be a name for those people… What are they called? It’s on the tip of my tongue… Oh, yes: Artists. In particular, actors, actors in theater and film. During my first year at the university I majored in Mathematics and took one course in Theater because I missed writing. It was a short walk between a talk with a genius who shared with me his contemplations about what multiplication really is – and walking into the Theater department, where two actors were reenacting Romeo and Juliet in the cafeteria to everyone’s delight. These two types of people do not live in the same world. Here’s where my two worlds collided while rehearsing The Indestructibles, my low-budget epic SF film. On the one hand, I write books, plays, and work on films. But that sometimes earns decent money and sometimes it doesn’t. I have to help support my family, so I have a real job in high-tech with people who live in the real world. Seeing as The Indestructibles is a low-budget production, we rehearse where we can. A couple of weeks ago, I suggested one of the conference rooms at my job, since it’s big and has a big carpet we can use to rehearse on (part of the film takes place on the ground). It was nighttime, and most of the office was empty. However, it wasn’t completely empty. The collision began innocently enough when I let the two actresses in, and had to walk with them through a long corridor, getting stares. The next day I would get quite a few questions, with a wink-wink here and a nudge-nudge there, about who those two beautiful women were and what was I possibly doing with them, wink-wink, nudge-nudge. But that’s nothing compared to what happened when the rehearsal began. It was just the three of us in the room, and we started to set up the scene. The two actresses were on the floor, one was lying down, the other talking to the ‘camera’. Then the actress who was talking bent down to kiss the other actress, who played her sister, on the cheek. I was a foot away, on my knees, staring intently at them. That’s when someone walked in to say good night. Feeling very comfortable in rehearsal-world, I told him good night, and continued with the scene. A few minutes later, one actress was hugging another, the two of them still on the floor, and me on my knees next to them, when one of the vice presidents of the company stepped in to say good night. I told him goodnight. And once again I was starkly reminded that I live in two worlds, and that jumping on tables to portray a character, breaking into a dramatic monologue, purposefully bumping into doors to get a laugh, and spending time with two women on the floor, are all things that belong to one world and not the other. I can tell you with confidence that one of these worlds is a lot more fun than the other. The question I keep asking myself as I plan the shots for the film is: Is there a new cinematic language to be invented? I have a problem with the old cinematic language. It’s built for budgets. Everything we see falls under the scale that has Hollywood on one side, goes through almost-Hollywood, down the scale to not-even-close-to-Hollywood which is only a step above just-pure-piss. As you recall, The Indestructibles was born out of the fact that these days I have the technology to create film. There’s no need to beg for big budgets or to kowtow notes from executives who know nothing about story or art. I have a writer, director, and cameraman at home (me), I have a camera, and I know great actors who would be willing to participate. There’s no reason I shouldn’t be able to create new, original SF films at home! In fact, there’s no reason not to create epic SF films with absolutely no budget… if you know what you’re doing. The Indestructibles is an epic SF film about superheroes, designed to be created with everyday means. In this film journal, I’ve talked about how I created the story in a way designed to give the full SF epic experience, about how I got rid of the editor by shooting in one-shots (editors are expensive and the budget is zero), choosing the actors, the rehearsals, and about the different choices I had to make along the way. But one thing still haunted me. I didn’t want to make the mistake I saw repeated around me. Look around at the absolutely best web series that exist today. Some use ordinary shots and look homemade. I don’t want to be that. Others try to create a look that’s as sleek as a Hollywood movie, trying to hide the fact that they had a budget that’s only in the thousands of dollars or, if they’re lucky, in the tens of thousands of dollars. What you get then is a shot that’s taken out of a professionally sleek Hollywood film, followed by a shot that’s trying to be, but clearly didn’t have the budget for it. The switch from one to the other is bad for the film. It takes the viewers out of the film and magnifies the not-Hollywood issue rather than hides it. So the question that keeps haunting me is this: Is there a way to create entirely new language that is completely different from what the viewers have ever seen? Something that tells you how much it cost and at the same time looks artistic and professional? Something that when you watch it doesn’t feel like it tried to be something it couldn’t be? Something that is so authentic it doesn’t get you thinking about how cheaply it was done? Has everything been done or can I find something new? It starts with the credits. Credits are something we’re so used to seeing, we never really think about them. Today, almost any editing program gives you a way to show the credits in a way that seems to be taken out of a Hollywood film. They give you the same fonts, the same effects of the credits in the beginning of the movie appearing and disappearing. The goal is to look professional. You know, like Hollywood. But, as I said above, I don’t want to create even a whiff of Hollywood so as not to create a dissonance with the rest of the film. The credits had to be different, too. Could I find an alternative to the credits that fits all the criteria I’ve mentioned above? The Indestructibles, as you recall, is about superheroes, but also about superheroes that are brain-dead but just can’t die. One of the characters is, somewhere during the story, just such a female superhero (played by Nathalie klein Selle, whom you’ve seen in the poster below). Part of the film is about how these ‘almost-dead’ superheroes are abused by regular people, and their bodies treated like trash. It’s not something you’ve seen before. It’s inexpensive but doesn’t appear to be created from a lack of budget. It’s jarring. It’s emotional. It’s not Hollywood, but it doesn’t make you think: These people couldn’t do Hollywood. That’s the new language I’m trying to create. In planning the shots for the film, I’m trying to create the same effect. I won’t reveal any more than I have now, but I will say that the point is to make something that was shot by an unprofessional (a character in the film) and to suddenly fall into great moments of art without meaning to, then to snap back to the regular composition. Will it work? That’s for you to say. Speaking of which, the film will be released on the web, but at first it won’t be released publicly. It will only be released to a small audience. If you want to be part of that audience and you want to see it before everyone else does, please email sfonweb@gmail.com with the subject line, The Indestructibles. You’ll immediately be added to the list. Writing a film journal makes you retrospective. As we’re edging towards the end of rehearsals for The Indestructibles, my low-budget epic SF film, I think it’s time for some comic relief. Here are the three most ridiculous moments had over the years, rehearsing for theater and film. At third place, we’ve got a moment most of us have experienced, though perhaps not in such an extreme way. You know how sometimes, when you get very nervous, your brain seems to leave your body completely and things you knew very well for all your adult life are suddenly beyond your ability to grasp? This was the case for the actress we’ll call H.
H was playing a lead role in a comedy I wrote for the theater, The Kid Who Turned into an Egg, playing the little kid. In this scene, she was put in a small cage. Halfway through the scene, she would slip through the cage’s bars and get out. This was never a problem. The distance between the bars was great and she was so small she could fit in her own purse. One rehearsal, she was sitting inside the cage, when suddenly the show’s producer came in. The producer was kind of a bigwig, which already made H nervous, and, in addition, H wanted the producer to hire her for other shows as well. The second H spotted the producer, her brain left the building. The director called H to come out of the cage. Now, slipping through a set of bars seems trivial to normal, non-nervous people such as yourselves. The task, however, is not trivial, to anyone whose brain has left the building. Wanting to follow the director’s direction, H put one leg between one set of bars and another leg between another set of bars, then tried to pull herself out of the cage. She tried this again and again, not understanding why she wasn’t out of the cage yet. Once I literally picked myself up from the floor, where I had dropped from laughter, I explained to her that both legs had to go out of the same two bars. She then got out safely. As a small side note, I’ll just add that H indeed became one of the producer’s favorite actresses, and she worked for her many times in future shows. At second place, we’ve got a ridiculous moment, which proves that direction, when given, should be precise, or bad things could happen. This time, two men were carrying a woman on their shoulders. The woman had one leg on one man’s shoulder and another leg on the other man’s shoulder. They were carrying her like a queen from place to place. I’ll let you guess what happened next. Go ahead. Take a moment. That’s right: The man on the right (his right) turned right, and the guy on the left (his left) turned left, immediately threatening to snap the woman’s legs like a wishbone. She screamed, they stopped, and no one was hurt. Now you see why it’s important to be clear when talking to actors. This one is my fault. Actually, it’s no one’s fault. Sometimes things look one way when they aren’t, and sometimes things sound one way even though the speakers’ intentions are completely different. This is one of those cases. As happens once in a while, since I am a writer of science fiction, I happen to use the word ‘concoction’. It happens. There’s nothing wrong with it. As also happens once in a while, when using an actress whose original language is not English, even though her English is perfect, a word here or a word there may get the stress on the wrong syllable. She: Line line line CONcoction. I hope you enjoyed this comedy relief moment in the film journal. Next time, we’re going to go back to talking about what happens when superheroes go bad, how Earth can be saved, and how to film it all with no budget. We’re at the rehearsal stage right now. After deciding to write, direct, and produce an epic SF film about superheroes with no budget (henceforth: “The Indestructibles”), after finding actors, and after shooting the poster ahead of time (with the tagline “Even gods must die”), we’re finally nearing the end of rehearsals. Most of Hollywood wouldn’t like the way I rehearse. In fact, they wouldn’t like the fact that I rehearse, and certainly not for months. Not only do they not have time for it, but there is a sense in Hollywood that actors that rehearse can’t give you truth. If they only just learned the text, then when they say it for the first few times, they appear genuine, their acting ‘real’. If they say a line more than a few times, it loses its freshness and the actors appear to be acting. Setting aside the fact that this approach means that acting in the theater can never be good (of course it can and is), and setting aside the fact that good actors have known for thousands of years how to deliver a line again and again and always find a way to keep it fresh for themselves, my approach is that, as a general rule, delivering lines without rehearsals leads to a lack of depth while good rehearsals lead to complexity. Hollywood has a stock of actors that directors know ahead of time what they’re going to give when the cameras are pointed at them. Their first delivery, even when they work hard at home on building a character, can only have so much complexity. Expecting stock acting, you get stock acting. My approach is different. First, we begin reading the script and adding a layer to the character that appears throughout: an aspect of the character’s personality, a pervasive mood, an important action, etc. Then, when that’s done, I let the back of the actors’ minds deal with it and let it sink while we tackle different aspects that can be found in the text. Then we put in another layer on top of it, then another layer, then another layer. What you get is a character that can give you conflicting emotions, conflicting actions set next to each other, time and time again in the film. The actor can also show experience with some of the subject matter, as if some things are old news while others are fresh. The actor can jump from one emotion and one mind-set to another quickly, then back again, since both have to do with what the character is going through. The Indestructibles, as you may recall, is built of seven six-minute one-shots, meaning that there is no editing, no pauses in acting, no chances to do a line twice: The actors have to get complex characters, complex situations and complex text without stopping to shoot again. You can only get that with rehearsals. When Mike Nichols, who is a master at getting great acting out of actors (and, yes, he rehearses), was a guest in The Actors Studio, he explained his approach. His trick is to tell stories about himself, intimate stories that place him in the emotional place of where the characters presently are in the script. He leaves it to the actors to understand that place and to adapt it to their acting. A good friend of mine, who is a great theater director, though you’ve never heard of her, has a slightly different approach. She says, “I tell a story, they tell a story.” The first step is what Mike Nichols does. But when she finishes telling her story, the other actors feels it’s only natural to tell an intimate story as well, about the same emotion. The director then uses that honesty to show where the actor should be. My approach is somewhere in the middle. Sometimes I use the first method, sometimes the second, depending on the person in front of me and what I think they need. There are different stories that get told for different layers of the same text. The same line can have conflicting stories told about the character’s emotional place when saying it. Hopefully, the result is equal to the weight I’m giving it. But you know what? Wait a couple of months and you’ll be able to judge the result for yourself. Dan: You’re acting like a crazed psychopath. Roseanne: [snorts] Well, the voices in my head disagree. There’s a war going on. And it begins every time a film director is doing his job. If the drums of war are missing, the director isn’t doing his job right. I’m happy to report that this war has finally reached the rehearsals of The Indestructibles , my indy, no-budget, epic sci-fi flick for the web. Let’s observe the two adversaries as they get into the ring. On the one side: the writer.The writer creates an idea out of nothing. He creates a world, its characters, their interactions, the plot, the surprises, the beginning, the middle, the ending, the history of what came before, and the hints of what must come later. The writer creates everything. And so the writer thinks he understands his creation and knows what’s best for the film. But then his opponent steps into the ring, the reigning champion: The dirrrrrectorrrrr! The director, being a completely different person, takes the writer’s script, which hopefully he likes and is connected to its different layers, and then adds his own interpretation. The director has a perspective the writer doesn’t have and adds more layers, more depth, and hopefully fills in the holes in the writer’s blind spots. When a good director takes on a good script, his interpretation improves it in a way the writer never could. But to do that he has to stray from the writer’s vision to create something new. The question is, what happens when the director and the writer are the same person? In previous productions, I’ve never had a problem. When I wrote a script or a play I later directed, I was alone in the ring. When writing the piece I felt like I was king of the world, having no one to tell me my interpretation for the piece is lacking. But the second I finished the play or the script and put on the director’s hat, the director (me) gave a knockout to the writer (me) and completely ignored anything the writer had to say. It was a click in the brain. The second I put on my director’s hat, I saw my own script differently, causing me to put different layers than the writer (me) had thought were necessary. Usually, during a first read with the actors, they would read what the parentheses (the writer’s instructions to the actors, indicating characters’ tone [sadly, haughtily, etc.] and attitude, or even pauses). At that point, I would stop them and tell them that the writer of the script (or play) knows absolutely nothing about film (or theater), and anything that is in parentheses should be completely ignored. The writer’s an idiot, I would say, and I should know. The knockout the director always gives the writer never came. In fact, I (the director) felt pretty good about my (the writer’s) vision. Sure, it bothered me a bit that I agreed with myself, since I knew theoretically it was bad for the process. But since I agreed with myself, I couldn’t find any flaw in my reasoning. But then, as we slowly progressed towards the shooting, something nagged me (the director), something that told me that I (the writer) was wrong. Let’s recap what we already know about The Indestructibles. It’s an epic SF film, designed to be filmed with no budget at all and to give almost the full effect of a high-budget Hollywood film. (You want to know how that’s possible? Check out the first film journal.) So the film is limited to one location, three actors (one of which never talks, and another who appears only for two minutes at the end), and is shot in eight long one-shots (thus eliminating the cost of the editor). Sound impossible? Well, there was another element I failed to mention in that first film journal: according to the script, the camera never moves. The camera, in the script, belongs to one of the characters. She puts it down, presses Record, then allows it to record what happens next. I (the writer) thought I (the director) could actually find a way to do it: shoot a film that gives the equivalent feeling of an SF epic in eight one-shots in one closed location in which the camera never moves. And you know what? I (the director) still think I can. But I (the director) now think I shouldn’t. I finally had enough balls to stand up to myself (the writer) and tell myself what an idiot I think I am. So a change was made to the script, a change the director wanted and the writer didn’t. The film takes place in the future, after all, which means that the camera has now become a smart video camera that can float. It takes instructions through speech (‘Camera on’ and ‘Camera off’, for example) and has modes in which it can shoot. In ‘personal mode’ it will shoot the person speaking in close-up, as if it’s a one-on-one conversation with whoever’s watching; while in ‘party mode’ or ‘crowd mode’, it will shoot scores of people, constantly turning around to catch more and more people, for example. This allows the director to move the camera during the film, to create action through camera, to add a ‘voice’ to the camera, to free the actors’ movements, and to play more with composition. This should create a much better film than the writer had envisioned. Three… Two… One… The writer is down! The director wins by a knockout! Thank goodness for that, because I (the writer) feel so much better now about my (the director’s) film. So we shot the poster. A team of three went down to the beach at the very end of a sunny day. This was the team: Nathalie klein Selle, the supremely talented Dutch actress who plays one of the two leading roles in the film; Oren Hasson, who is, among other things, both a professional photographer and my father; and myself (writer and director). The concept for the poster was simple: Nathalie is a superhero who, though practically dead, cannot actually die. She’s been swept away by the seas and wound up on the shore. The original concept for the poster had her lying in the sea, half her face in the water, half out, eyes open wide, body dead. Working off the concept, Oren could start trying different alternatives to see what would work and what wouldn’t. Oren picked the location. He chose a piece of beach that was almost completely covered with seaweed. It looks amazing in the photograph, but was actually pretty disgusting in reality. Though the day was scorching, the sea was freezing. Nathalie got into the dress and into the water, quickly getting her head into position, half in and half out. We spent the next hour putting her in different positions, putting the camera in different positions, trying out different lenses and variations, until we felt we had enough good shots to choose from. At a certain point I found myself grabbing two fistfuls of seaweed saying, “I want to put this in her hair. Can I put this in your hair? Can I put this in her hair now?” Okay, I may not have phrased it exactly like that. It may have been phrased with more poise: “I think we should put more seaweed in her hair. Nathalie, do you mind? Dad, will it work in the picture?” But I wanted to say it like a six-year-old. Nathalie was a complete pro. She never complained about the freezing water and the wind, didn’t ask once to stop, and was completely there, emoting as her character, whenever the camera was shooting. During the following week, Oren went over the pictures, tweaked them, and sent me the best ones to choose from. I picked the one you see in the poster above, wrote the texts for the poster, and then met with Oran Almog, a gifted graphic designer. He turned the picture into a poster, and what a great job he did! As you can see, Nathalie’s red dress, which she brought from home, worked supremely well against the color of the seaweed, which neither she nor I knew would be there. Luck plays a huge role when creating a work of art, whether it’s a film, a poster, a theater show, etc. I’m a big believer in the magical appearance of good luck. It’s not that I think luck goes my way in life or that good things are more likely to happen to me than not, it’s that when you’re working on art and you’ve done all your homework and you work with talented people, suddenly almost everything falls into place in a better way than you would have ever expected. Here’s another angle. Looks great, but not what we were looking for. I’ve seen this happen again and again. When we shot Heart of Stone, my last film, the actors were so talented and so prepared, that it seemed, magically, as if everywhere I put the camera was the perfect place to shoot from. In fact, we created an environment for the actors in which it seemed like every new choice they made was good, in character, and helped tell the story. It was a shock to a couple of them, when the shooting was over and they moved on to their next projects, that suddenly not every decision they made was a good one. It was the same thing with shooting the poster. I didn’t get a chance to see Nathalie in the dresses ahead of time (remember: The Indestructibles is low budget, people are also working for a living, and free time is scarce). She picked a few, emailed me pictures of the dresses on a bed, and we picked three to bring to the location. I didn’t know what the beach would look like ahead of time, either. But this is why it worked: the original concept was good and represented the film; Nathalie is talented and completely grokked her role; and Oren is talented and understood the concept completely, but wanted to add his own element to it. So when we got to the beach we discovered that the red dress worked best with the seaweed green, and, as if by magic, everything clicked better than expected. I wasn’t worried, because I was certain that if the red-green coincidence hadn’t occurred, something else would have happened to make the photo shoot magical. When you’ve got the right people, magic happens every time. You might think it’s next to impossible to pitch The Indestructibles to actors, since they’re asked to do it for free. Most of the ones I approached actually jumped at the chance. Become Part of a Fairy Tale!